Burnley are in pole position to finish the ‘best of the rest’ in the Premier League. 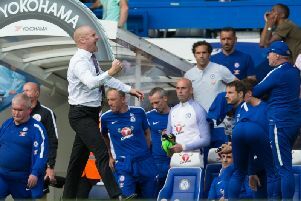 But Clarets boss Sean Dyche insists only the ‘big six’, including Thursday night’s visitors to Turf Moor, Chelsea, can be assured of their Premier League place from season to season. Burnley are seventh, nine points clear of Leicester City in eighth, after their 2-1 win over the Foxes on Saturday. And seventh place will bring European football for the first time in over half a century, providing any of the remaining four teams in the FA Cup, other than Southampton, lift the trophy next month. Burnley are continuing to develop and grow on and off the pitch, but improving on this season – the club’s best campaign since 1975 currently – will be a tough ask. Dyche said: “On an ongoing basis, everything is a challenge for us. “I don’t think we will be in a position, I will be surprised, if this club can grow into a position where it is not. “Because there is a reality to clubs like Burnley. “It is unlikely it can get so powerful, financially, where you become one of the top six, which probably all of us think are going to be in the top six or around, certainly not in relegation trouble. “Highly improbable they are in relegation trouble for however many years – whereas the rest, as we have seen this year, with some very good clubs looking in real trouble, it is very difficult. “Are we moving forward? Yes. Can the club move forward and build? Yes, it already is doing. Proof of Burnley’s growth is there for all to see, but, among the most impressive statistics is they have the third-best defensive record in the division, bettered only by the top two, champions Manchester City and Manchester United. Dyche feels the pressure they were under last season has served them well: “The thing you learn in the Premier League is you are going to have to do that at times (defend), particularly away, and that goes give you practice. “We had it a lot last season, we only won one away game, and that does form a way of working that builds resilience. “When I signed Tom Heaton it was heavily questioned because he had just been relegated. But my thinking was, if you have been relegated but you are still trying to keep the ball out of the net, as he was, then that is an amazing thing because you can go under with that sort of stuff, but he wasn’t that sort of character, which is why I signed him. “You can learn a lot from that, tough times like that. If it is paying back for all the work in the past and how the players have experienced and learnt from that, then that’s fantastic.